I just finished my artwork for my 2014 race shirts. Thought I would give you guys a sneak peek of them. I’m pretty pumped on how they look, can’t wait to get them on a shirt. Pretty excited for 2014!! Hope you all had a very Merry Christmas. See you guys at the races soon. Thanks for reading and God Bless. 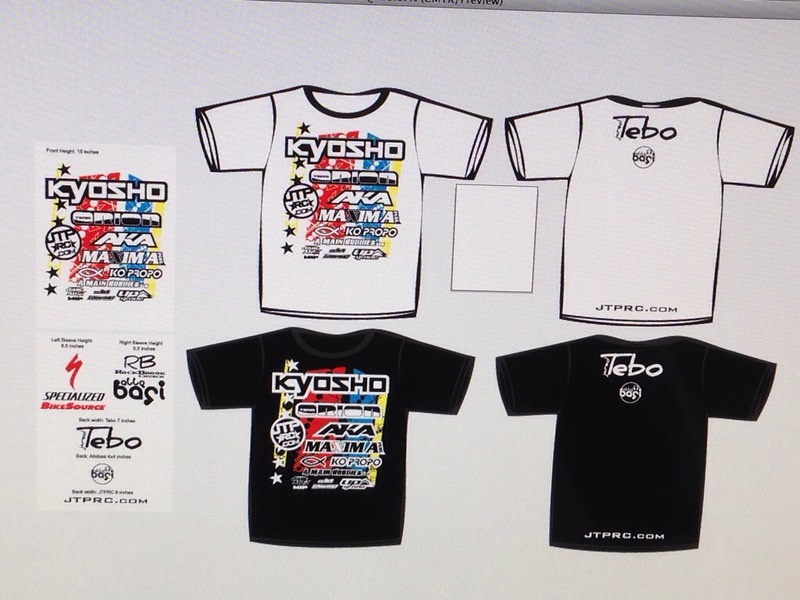 Nice shirt layout, A Main Hobbies as a sponsor too, awesome. Who does your shirts? They look really good. Thanks. I do my own artwork. It’s a little hobby of mine, it’s fun. Yeah got Amain and a cool thing with specialized bikes. We will do official press releases in the new year. Hi tebo i have a other question.how many limiters are you use for the droop standard inside of shocks,1mm front and 2 mm rear? are we able to buy your shirts? Hello Jared….shirts look nice, you seem to have a keen eye for design work, your keeping the yellow, love it! Hey man, make sure to bring me one to SmacTrac…Ill trade you a ice cold case of Prairie Farms chocolate milk for one….LOL! Is it possible to buy your t-shirts? I just wanna say thanks for signing a t-shirt that my friend Oisin of redrc got signed for me.